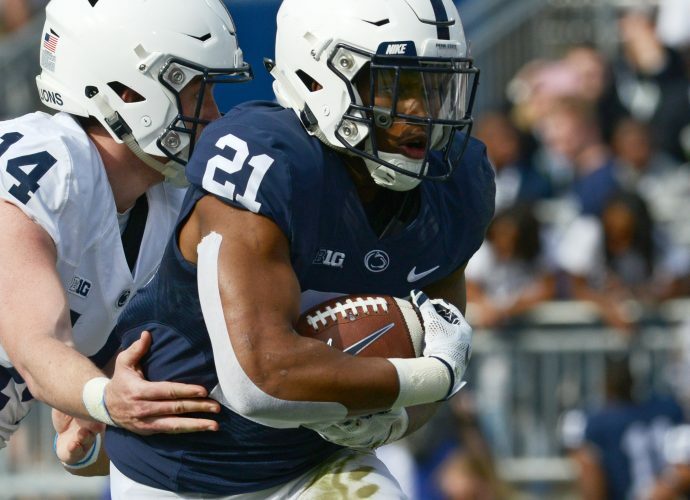 UNIVERSITY PARK – Penn State players speak with great respect about Deion Barnes, an enormously talented rising sophomore defensive end who looks every bit the part of a future NFL standout. Barnes doesn’t want to be just good, he wants to be great. He took the first steps toward that during an impressive freshman season, and he’s counting on even better things from himself this fall. Barnes, a 6-foot-4, 244-pounder from Philadelphia, isn’t about to let all the hype go to his head and lead to a sophomore slump. Barnes doesn’t want to be known just as a pass rusher and realizes there were times last season when he was out of position against the run. Improving that aspect of his game is a priority this year. Barnes also noticed while watching game film from last year that he missed out on about four sacks, which would have given him 10. Even though he was honored as the conference’s top freshman, Barnes wasn’t satisfied with his own play. That’s the kind of attribute that can only make him better. Gress knows better than anyone how challenging it can be going up against Barnes. Despite being one of Penn State’s best returning players, surprisingly, Barnes said he was not contacted by any other schools over the winter about possibly transferring. PSU players are allowed to transfer until August without having to sit out a year, as part of the NCAA sanctions. Like most players on the team, Barnes has benefited from Penn State’s new strength and conditioning program. A couple more years in that can only help him even more. “The biggest thing about this spring compared to last season is he’s bigger, faster and stronger,” Gress said. Barnes, who redshirted in 2011, seems well aware of the increased expectations for him this season. He was able to fly under the radar as a freshman, but now every opponent will know who he is and will game plan even more to try to nullify him. It will be up to Barnes, then, to make the adjustments necessary so that he can have a major impact despite being more of a focal point for offensive lines.